Geshe Lhundub Sopa, the founder and spiritual guide of Deer Park Buddhist Center was a Tibetan Buddhist monk, who was recognized worldwide as one of the great living spiritual masters of the Tibetan Buddhist tradition. He was particularly renowned for maintaining the high standards of scholarly learning while personally embodying the qualities of humility, tolerance and compassion. Geshe Lhundub Sopa was trained in his youth in the most rigorous Buddhist monasteries in Tibet. He was one of the few remaining Tibetan masters who received his training in his homeland prior to the Chinese occupation. Geshe Lhundub Sopa was born in the Shang region of Tsang province of Tibet in 1923. At the age of 8, he entered Ganden Chokhor Monastery in Shang, Tibet, where he took his first Buddhist monastic novice vows. And at the age of 18, he entered and began his monastic education at Tsangpa Khamtsen regional house, at Sera Je Monastery in Lhasa—one of the three great monasteries of the Geluk tradition. While in Sera Monastery, Geshe Lhundub Sopa rose in the ranks of the prestigious Lharam class in preparation for the highest Lharampa Geshe degree. In Tibet Geshe Sopa’s abilities were recognized early on, leading him to be selected as one of the very few scholars to personally test His Holiness the Fourteenth Dalai Lama at his final Geshe examinations in 1959—even before Geshe Sopa had completed his own examinations. Following the communist Chinese invasion of Tibet in 1959, His Holiness the Dalai Lama was forced to escape to India. Geshe Sopa followed in His Holiness’ footsteps a few days later, embarking on the arduous journey across the Himalayas to begin the new life in India as a refugee, to be followed by thousands of Tibetans. Having his monastic studies in Tibet, in 1962 at Buxador, India, Geshe Lhundub Sopa was examined and awarded the first place ranking of the Geshe Lharampa degree, the highest title Geshe degree—chosen from among the best scholars of the three great Geluk monasteries. Preparation for the Geshe degree typically involves a twenty year curriculum of rigorous study and debate. Two years after the Tibetans were forced into exile by the communist Chinese invasion of Tibet, His Holiness the Dalai Lama asked Geshe Sopa to travel to the United States, accompanying three young Tibetan lamas to learn English—starting his lifelong mission of bridging cultures and sharing the Dalai Lama’s vision of global human values and ethics. In 1962, Geshe Sopa arrived in the United States and settled in a small Mongolian Geluk monastery in Freewood Acres, New Jersey, started by Geshe Wangyal, a Mongolian from Drepung Monastery. He slowly attracted many students who were interested in the Buddhist philosophy, language and culture. A few years later Professor Richard Robinson, who had previously started a Buddhist Study Program at the University of Wisconsin—Madison, invited Geshe Lhundub Sopa to teach classical Tibetan language as his teaching assistant. 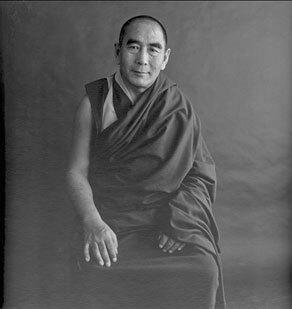 This led to Geshe Sopa becoming the first Tibetan tenured in an American university. Geshe Sopa taught at the University of Wisconsin—Madison for over thirty years, advancing in the ranks from instructor, to assistant, associate and full professor in the Department of Southeast Asian Studies. Upon his retirement from the University of Wisconsin in 1997, Geshe Lhundub Sopa became a Professor Emeritus. During this time Geshe Sopa had the opportunity to travel and give Buddhist teachings in the United States and around the world, including: Canada, Mexico, Italy, England, France, Switzerland, Greece, Australia, New Zealand, Taiwan, Hong Kong, Japan, Tibet, India, Nepal, Thailand, Costa Rica,Venezuela and Brazil. The many famous students of Geshe Lhundub Sopa in Lhasa and India included numerous Tibetan scholars and masters like Geshe Jampa Tegchok, Geshe Lobsang Tsering, Geshe Lobsang Donyo—all of whom later became Abbots of Sera Je monastery in India, and Khensur Lobsang Tenzin, ex-abbot of Gyume Tantric College, who is currently the Jangtse Choje—directly inline for the Ganden Tripa position, representing the lineage holder of Lama Tsongkhapa in the Gelukpa tradition. Other well known students included Lama Yeshe and Lama Zopa Rinpoche. Geshe Sopa has also trained many of this country’s first generation of respected Buddhist scholars and translators, including Jeffrey Hopkins, José Cabezón, John Newman, Beth Newman, Roger Jackson, John Makransky, and others. Drawn by Geshe Sopa’s renowned ability to clarify Buddhist concepts and inspire students to live by these principles, many students began requesting him to give instructions outside the formal academic setting. In 1976, Geshe Lhundub Sopa first founded Ganden Mahayana Center in his home in Madison, Wisconsin. In 1979, at the request of Geshe Sopa, His Holiness the Dalai Lama made his first visit to the United States arranged by the University of Wisconsin. During this visit, Geshe Sopa formally requested His Holiness to bestow the first Kalachakra empowerment for world peace in the West. The elaborate Kalachakra empowerment had never before been performed outside of Tibet or India. After His Holiness agreed to this request, preparation began for this large scale event. In 1981, a parcel of land was purchased in Oregon, Wisconsin for the purpose of hosting the Kalachakra empowerment. This land would later become what is known today as Deer Park Buddhist Center. Geshe Sopa has continued to facilitate an on going relationship with His Holiness the Dalai Lama. His Holiness has made eight additional visits to Deer Park Buddhist Center over the years. In 1996 Geshe Sopa became a Trustee on the International Peace Council, an interfaith organization that promotes peaceful resolution of differences. Geshe Sopa’s travels to Belfast, Jerusalem and Chiapas, Mexico as part of the Peace Council projects working to end violence in those areas, reflect his heartfelt commitment both to public service and non-violence. Geshe Sopa’s life work was centered in the heartland of America, as a Buddhist monk, a university professor, a committed peacemaker, a consummate teacher and as an extraordinary human being inspiring all those he met. For generations of students, Geshe Sopa was a shining example of the human capacity for developing kindness and wisdom. With his international support, a solid tradition behind him and his own personal qualities, Geshe Lhundub Sopa was the guiding force behind the Deer Park Buddhist Center and Monastery, and was instrumental in planting the roots of Tibetan Buddhism in the United States. At this time, Deer Park Buddhist Center is the only full-scale monastery and teaching center upholding the Dalai Lama’s tradition in the Midwest. If you wish to read a fuller account of Geshe Sopa’s life, please refer to Like a Waking Dream, the Autobiography of Geshe Lhundub Sopa from Wisdom Publications. Peacock in the Poison Grove: Two Buddhist Texts on Training the Mind – Edited and Introduced by Michael Sweet and Leonard Zwilling.